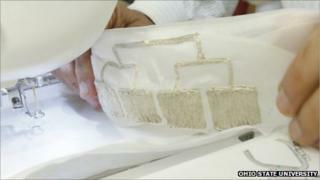 Radio antennas that can be sewn directly onto clothes have been developed by US researchers. The team from Ohio State University created a prototype using plastic film and metallic thread. The scientists reported in an IEEE journal that the system's range is four times greater than that of a conventional antenna worn on the body. The technology could potentially be applied in a number of fields, but is primarily designed for military use. "Our primary goal is to improve communications reliability and the mobility of the soldiers," said Chi-Chih Chen, one of the researchers. "But the same technology could work for police officers, firefighters, astronauts - anybody who needs to keep their hands free for important work." The idea of hiding antennas is not new. The mobile phone industry moved away from external aerials in favour of those concealed inside handsets. But while most manufacturers have managed to incorporate the antennas without much trouble, Apple ran into problems. When the iPhone 4 was released last summer, some owners reported reception issues. The phone's casing, which is made of stainless steel, also serves as its antenna. Users discovered that - by gripping the handset - their skin short-circuited a gap in the aerial, causing signal strength to drop. This has not been a problem for the Ohio State University team, as the prototype antenna is first embedded into plastic film, which is then sewn onto fabric - using an ordinary sewing machine. To make sure the signal is strong and the antenna is multidirectional, the scientists place several antennas onto a piece of clothing - at the front, back and on both shoulders. These work together, along with an integrated computer control device, to sense body movement and switch to the optimal antenna. Currently, the technology would cost about $200 (£120) per person to implement, according to the developers. Once it is in mass production, the price is expected to come down.